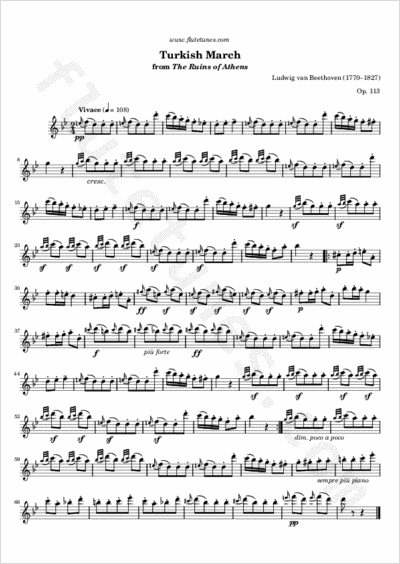 This well-known classical theme takes its name from the Turkish style popular in music at the end of the 18th century. The theme was first used in Beethoven's 6 Variations on an Original Theme, Op. 76, of 1809. Two years later, Beethoven wrote an overture and incidental music to a play called The Ruins of Athens, which premiered in Pest in 1812, and the Turkish March appeared as item No. 4 of the incidental music. That's why many music lovers associate the theme with The Ruins of Athens, even though that was not its original appearance. As you will notice, the dynamic scheme of the march is highly suggestive of a procession passing by, starting out pianissimo, poco a poco rising to a fortissimo climax and then receding back to pianissimo by the coda. The present transcription mostly follows the piccolo part of Beethoven's orchestral setting. Thanks to Sunny for suggesting this piece!